Amateur and professional photographers who use DSLR cameras understand that shooting at maximum resolution requires a large capacity, high-speed memory card. 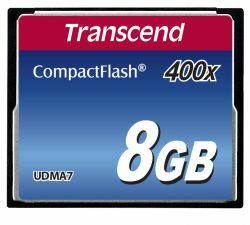 Transcend's "Premium" series 400x CF card offers an excellent combination of impressive transfer rates and vast storage quantity. Additionally, the top-tier MLC NAND flash chips inside are durable and reliable.